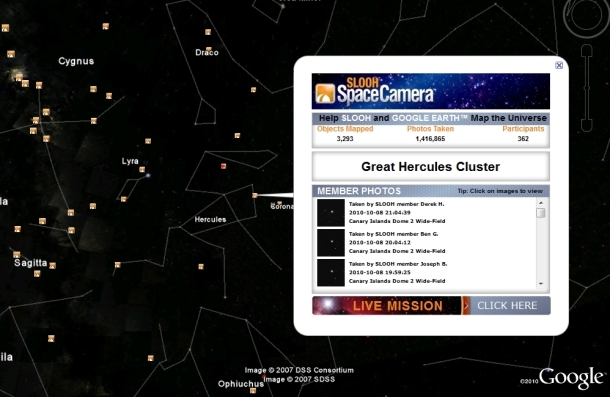 As part of Google’s ongoing mission to map everything, it’s partnered with Slooh to add in amateur star photography to the Sky in Google Earth. You have to pay for the privilege, but it’s likely to add a fascinating new wrinkle to amateur astronomy the world over. Until now Google’s Sky facility has let Google Earth users view professionally sourced imagery of the heavens. But unlike many industries or sciences, amateur astronomers are a major part of sky-viewing activities all over the world–and they occasionally spot things the pros miss–so Google’s now moved to involve them more in its software, via a partnership with Slooh. Slooh’s usual business trick is connect Netizens with professional-grade astronomical telescopes over the Net itself, and many of its 50,000-plus users pay to access its systems to snap parts of the sky they’re interested in with an instrument infinitely better than they themselves could afford. The deal with Google may be thought of as a parallel to the Panoramio model for Google Earth, which lets individuals upload pictures of specific locations on the planet–just this time it’s heaven-based, and you’ll have to be a paying member of Slooh to upload content. Everyone who views Sky will be able to turn on the Slooh layer, however. As well as being fun, and a way for Google to connect to another new audience, there’s one potential upshot: It’s entirely possible that using Slooh and Sky, users may observe totally new phenomena–like a comet. Fab news–but we’ve got fingers crossed that, in order to benefit amateur astronomers who don’t use Slooh and have they’re own serious telescopes, that Google will open the idea up to other image sources too.